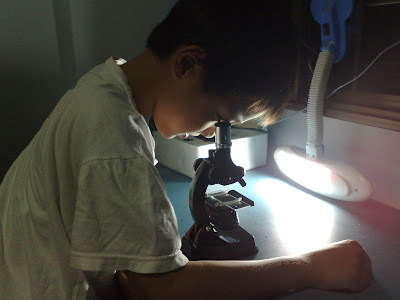 I bought a cheap, toy like microscope for Ray. He is enjoying it now. We explore all the fabric, put sugar and salt under our eyes, we even squash an ant and watch it struggle while we study. We feel like a bad god. Not enough, we went downstairs and scoop some filthy drain water to look for microscopic hopes. You will be surprise how clean they are.